NEW YORK (CNNMoney) -- Colonel Sanders is an iconic American brand image. The K in KFC is for Kentucky after all. So it may come as a surprise that KFC's parent company actually generates more sales from China than the United States. Yum! Brands (YUM, Fortune 500), which owns KFC, Pizza Hut and Taco Bell, has been a phenomenal success in China. How do you view the economic relationship between the U.S. and China? With China's president Hu Jintao in America this week to meet with President Obama, as well as a bevy of U.S. business leaders, there is more attention on the world's most populous nation than there has been in quite some time. And Yum may be a model for other large multinational U.S. firms that are attracted to the vast growth potential in China. Yum's China sales hit $1.2 billion in the third quarter of 2010, up 20% from the same period a year ago. Meanwhile, Yum's sales in the U.S. totaled $970 million, down 8% from the third quarter of 2009. There is no denying that China is now the biggest reason to consider investing in Yum's stock. "China and other international markets are going to continue to drive Yum's sales and profits, not the U.S.," said John Fox, manager of the FAM Value Fund in Cobleskill, N.Y.
Clearly, China is a market that the U.S. can't ignore even though there are a myriad of political, cultural and geographical challenges. How has the company been able to do it? In an e-mailed response to my questions, Yum cited its "first mover advantage" as a key reason for its success. The company entered China in 1987 with KFC and introduced Pizza Hut in 1990. Fox added that Yum wisely didn't try to transplant the exact look and feel of its U.S. restaurants to China. "Their restaurants are different in China. They are more like casual dining and upscale than fast food. They've made the menu acceptable to locals," he said. Yum pointed out, for example, that KFC restaurants in China also feature seafood and beef while Pizza Hut serves rice dishes. The company also has a 27% stake in Mongolian-style hot pot chain Little Sheep. But what's most remarkable about the company's growth in China is that it is almost entirely due to KFC. Yum had 3,664 restaurants in China as of the end of the third quarter. More than 3,000 of them (83%) were KFC stores while the remainder were Pizza Huts. Yum did open some Taco Bells in China in 2003 but they were closed by 2008. The company didn't indicate if it planned to reintroduce Taco Bell in China, only saying that it intended to make Taco Bell its third global brand and noting that there were new restaurants opened in India and South Korea. Even if Yum doesn't try to bring chalupas back to China, it would appear that it has a long way to go before it saturates the Chinese landscape with Pizza Huts. In Yum's other international markets, Pizza Hut makes up more than a third of the company's total stores. Yum has signaled that more growth in China is on the menu. The company announced Tuesday that it planned to sell two smaller underperforming chains it owns -- seafood restaurant Long John Silver's and A&W Restaurants, a burger joint featuring Dr Pepper Snapple Group (DPS, Fortune 500)-owned A&W root beer. In a statement about the sale, Yum said that it is "sharpening its long-term growth focus on building leading brands in every significant category in China." The company added that it expects profits from China and other international markets to reach 75% of total earnings by 2015, up from about 65% in the first nine months of 2010. That would be an astonishing feat. Yum rival McDonald's (MCD, Fortune 500) currently generates 56% of its profits from overseas markets. And China is still such a negligible part of Mickey D's total sales that it gets lumped into the Asia/Pacific, Middle East and Africa category for reporting purposes. But McDonald's is also recognizing China's allure. The company made waves last year by becoming the first U.S. firm to sell yuan bonds in Hong Kong. That move was later followed by construction equipment giant Caterpillar (CAT, Fortune 500). Yum would not say if the company planned any debt sales of its own in China. Still, is it possible that Yum, by focusing on China so heavily, could wind up being overexposed to that market -- especially if trade and currency tensions boil over between the U.S. and China? That seems like a stretch. Peter Wood, a co-manager for the Chase Growth Fund (CHASX) in Charlottesville, Va., which owns the stock, said that it's highly unlikely there would be a consumer or government backlash to Yum. "I really don't think there would be an impact from whatever happens between China and the U.S. regarding the yuan," Wood said. "Yum has done such a great job of becoming part of Chinese consumers' daily lives." 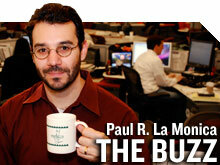 -- The opinions expressed in this commentary are solely those of Paul R. La Monica. Other than Time Warner, the parent of CNNMoney, and Abbott Laboratories, La Monica does not own positions in any individual stocks. Who has the upper hand in U.S.-China talks?